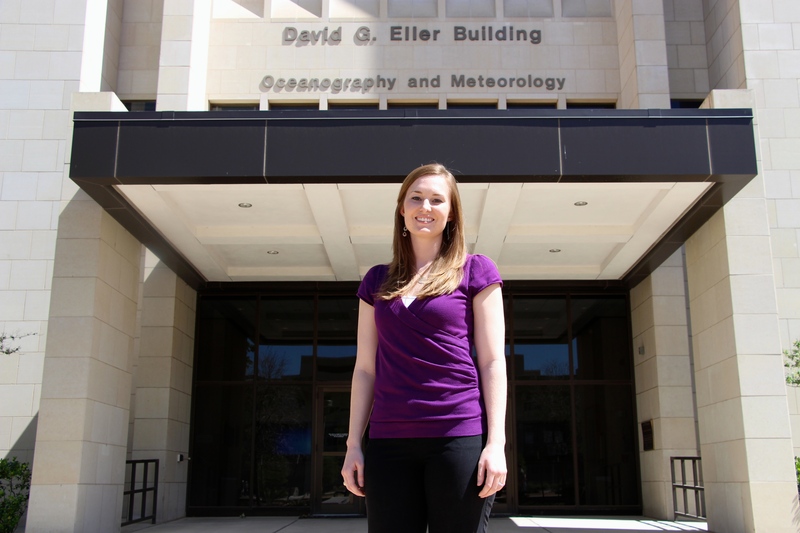 Emily Dykes ’08, program coordinator for Environmental Programs in Geosciences, was selected as one of four campus-wide recipients of the 2014 President’s Award for Academic Advising. Dykes was honored by Texas A&M Interim President Mark A. Hussey as part of the annual University Advisors and Counselors Spring Awards Breakfast in May. “Getting to be a part of students’ journeys and supporting them through their successes and struggles is a very rewarding and humbling process,” Dykes said. Recipients receive $2,000 and a plaque and are selected by a committee composed of three students, the president-elect of University Advisors and Counselors’ Executive Board, and a representative appointed by Texas A&M’s Office of the Dean of Undergraduate Programs and Associate Provost for Academic Services. Selection is based on nomination packets that include letters from fellow advisors, students and faculty. Dykes has been an advisor in the Environmental Programs since fall of 2008. She also received the College of Geosciences’ Robert C. Runnels Excellence in Advising Award in 2011. This summer she will be honored as a 2014 Texas A&M Fish Camp namesake, Camp Emily. “I am honored to receive this award because it hopefully means somewhere along the way, I have made a positive impact on a student’s life,” Dykes says. Emily Dykes ’08, program coordinator for Environmental Programs in the Geosciences.